Product Number : DCK211D2T. 10mm Single sleeve keyless chuck with automatic spindle lock. Two speed settings, variable speed and reverse switch. Aluminium front housing provides greater heat dispersion increasing motor life. DeWALT DCZ298S2T. DCD776 XR Combi Drill. DCF885 XR Impact Driver. 18v XR Combi Drill & Impact Driver. This is a DeWalt Factory reworked / reconditioned machine. Compact 13mm single sleeve keyless chuck with automatic spindle lock for quick and easy bit change with one hand. 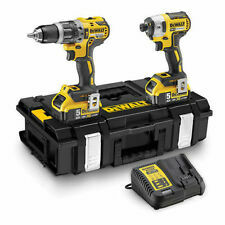 Dewalt 18v drill and impact driver brushless combi set. Condition is New. Only opened to take photos as you can see. Complete with two 18v lithium ion batteries Charger DCD778 drill DCF787 impact driver Documents TSTAK Box Thank you for viewing. DCD710 Drill Driver. Two speed settings, variable speed and reverse switch. Both these compact tools are designed to be light and manoeuvrable for ease of access and low operator fatigue. Compact, lightweight design. Carry case. DCF887 Impact driver. DeWalt DCK264P2 18v XR DCN692 & DCN660 Brushless Nailer 2 x 5.0Ah Li-ion DS400 Rework. 18V DCN692 Cordless XR Framing Nailer Features 1 x DS400 Heavy Duty Storage Carry Case Kitbox. Ergonomic tool design allows the nailer to fit easily between a 400mm centre stud. DCD796 Combi Drill Brushless motor technology for excellent efficiency. High power Brushless motor outputting up to 205Nm of torque ensures heavy applications are completed quickly. DCF887 Impact Driver. DeWALT DCZ298C2 1.3Ah 18v Lithium Ion Cordless + Impact Drill Set - BNIB . The soft grip handle provides comfort and a stable grip when working. Max Torque 155Nm, No Load speed 2800rpm & Impact per Minute 3200ipm. Max Torque 42Nm, No Load Speed 0-450/1500rpm, Beats per Minute 0-7650/25500bpm. 5 out of 5 stars - DeWALT DCZ298C2 1.3Ah 18v Lithium Ion Cordless + Impact Drill Set - BNIB . 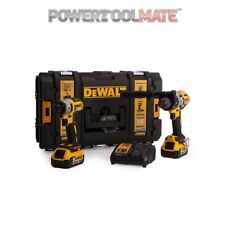 5 product ratings5 product ratings - DeWALT DCZ298C2 1.3Ah 18v Lithium Ion Cordless + Impact Drill Set - BNIB . DEWALT DCK264P2 18V Nailer Twin Pack Kit (2 Piece). Dispatched with Royal Mail 2nd Class. 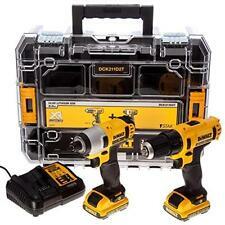 We have for sale this fantastic DEWALT DCK211D2T 10.8V Cordless Kit (2 Piece). Also has pictured adapters/drill bits. DCD796 OVERVIEW. DCF887 3 SPEED BRUSHLESS IMPACT DRIVER. Battery chemistry XR Li-Ion. Ultra compact, lightweight design allows use in confined spaces. Super lightweight and compact the tool is very comfortable to use and fits in small spaces. DeWALT DCK2059D2T. DCD777 XR Brushless Drill Driver. Weight: 1.3kg DCF787 XR Brushless Impact Driver. 2 x 2Ah Batteries in T-Stak Case. 18v XR Brushless Drill Driver & Impact Driver. Latest generation 18v XR Brushless compact drill driver featuring NEW XR Li-Ion battery technology. Brushless DCD796 G2 Combi Drill & DCF887 G2 3 Speed Impact Driver. DeWALT DCK266P2T. DCD796 G2 Combi Drill. DCF887 G2 3 Speed Impact Driver. 18v XR G2 combi drill featuring 5.0Ah XR Li-Ion battery technology. Dewalt DCD796N Brushless Motor Technology for excellent efficiency. other 18V XR DEWALT Power Tools. Dewalt DCF887N High power Brushless motor outputting up to 205Nm of torque ensures heavy applications are completed quickly. DEWALT DCD777 DCD777N Drill Driver Brushless BODY ONLY Stanley 1-68-738 Set. NEW 18V XR Li-Ion Brushless Compact Drill Driver featuring XR. Bright white LED with delay feature for improved visibility and flashlight functionality. The soft grip handle provides comfort and a stable grip when working. Max Torque 155Nm, No Load speed 2800rpm & Impact per Minute 3200ipm. Number of batteries2 batteries. Max Torque 42Nm, No Load Speed 0-450/1500rpm, Beats per Minute 0-7650/25500bpm. All as per box / picture. COLLECTION PREFERRED DUE TO WEIGHT. no overseas. 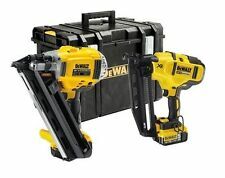 Introducing theDeWalt DCK264 Twin Nailer Kit. The tool has an ergonomic design to allow the nailer to fit easily between a 400mm centre stud. A reversable belt/rafter hook povides increased portability and versatility on the job site. DCD796 Brushless Combi Drill & DCF887 Brushless 3 Speed Impact Driver. DeWALT DCK266M2T. DCD796 G2 Combi Drill. DCF887 G2 3 Speed Impact Driver. 18v XR G2 combi drill featuring 4Ah XR Li-Ion battery technology. DCN692 Framing Nailer. DCN660 Finishing (2nd Fix) Nailer. Weight: 2.7 kg Nailer. Jam Clearing: Yes. Nail Length: 50 - 90 mm. Jam Clearing: Tool free. Nail Length: 32 - 63 mm. 2x 5.0Ah Batteries. 18v XR Brushless Tool Connect DCD797 Combi Drill DCF888 Impact Driver. DeWALT DCK2500P2B. Chuck capacity: 13mm DCF888 Impact Driver. This is a DeWalt Factory reworked / reconditioned machine. Allows user to enable and disable tool using Tool Connect app or automatically disable when out of range. DCS331 JIGSAW WITH DUST SPOUT. DEEP TSTAK CARRYING CASE. Latest generation premium Jigsaw featuring new XR Lithium Ion Technology. 2 X DCB182 4 AH LI-ION BATTERIES. Bevel Capacity 45 °. Battery chemistry XR Li-Ion. PLUS A DCL050 WORKLIGHT. HEAVY DUTY DEEP TSTAK CARRYING CASE. Battery chemistry XR Li-Ion. Battery Capacity 1.5 UP TO 5 Ah. 2 X DCB184 5 AH LI-ION BATTERIES. Battery Capacity N/A Ah. Length 301 mm. Weight 3.1 kg. Also supplied with: 2 x 18/54V 9.0/3.0Ah FlexVolt Li-ion Batteries and 1 x TSTAK VI. 1 xDCD996 XR BrushlessCombi Drill. image[,,,0,,9]#. Battery QTY. Head Weight. Range Model. Radio Type. Grinder Type. Dewalt DCF886 Dewalt DS150 Dewalt DCD995 Improved 140mm back to front length increases the versatility of this impact driver. Aluminium front housing aids heat dispersion for increased motor life. 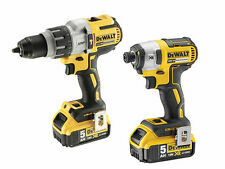 These are both professional grade brushless machines which use DeWalt's 18v XR lithium ion battery system. • 2 x 18v 5.0Ah Li-Ion Batteries. • Nail Length: 50-90mm. • Nail Length: 32-63mm. • Versatile 30 - 34° magazine angle will accept most clipped head & off centre round head paper tape or wire weld collated framing nails. Battery chemistry XR Li-Ion. Battery Capacity 5.0 Ah Max Torque (Hard) 95 Nm Max Torque (Soft) 66 Nm. Steel belt hook and magnetic bit holder ensure strong storage solutions. Drilling Capacity [Concrete] 24 mm Max. Introducing the DeWalt DCK264 Twin Nailer Kit. The tool has an ergonomic design to allow the nailer to fit easily between a 400mm centre stud. A reversable belt/rafter hook povides increased portability and versatility on the job site. DCG414 54 VOLT 5" 125MM ANGLE GRINDERINCLUDES SIDE HANDLE AND ALLEN KEY WRENCH. DCG414 Power 54 V Speed 9000 rpm Spindle Thread M14 Weight 2.2 kg Length 400 mm Height 125 mm. HEAVY DUTY DS300 SIZE TOUGHCASE CARRYING CASE. DCF887 3 SPEED IMPACT DRIVER. PLUS A DT71569 100PCE MULTIPLE BIT SET. DCD796 COMBI DRILL OVERVIEW. DCF887 3 SPEED BRUSHLESS IMPACT DRIVER. Compatible to use with DeWalt TSTAK COMI Case. Model: DCK2532P2. Model DCK2532P2. MPN DCK2532P2. DEWALT DCF887N XR 18v Brushless Cordless 3-SPEED Impact Drill Driver, Bare Unit. Bosch 18v Cordless Reciprocating/Recip Sabre Saw Bare Unit LBOXX 06016A8104. DCN692 Framing Nailer Features Ergonomic tool design allows the nailer to fit easily between a 400mm centre stud. DCN660 Finishing (2nd Fix) Nailer Features Belt hook (reversible) on 1st fix nailer. DCF887 3 SPEED BRUSHLESS IMPACT DRIVER. AND ALSO INCLUDES HEAVY DUTY BELT DWST1 75651 PLUS DG5120 AND DG5121 HOLSTERS TO SUIT EACH MACHINE. Battery chemistry XR Li-Ion. 2 XDCB184 5 AH LI-ION BATTERIES. The Dewalt DCK2059D2T contains the Dewalt DCD777 18v Li-ion Cordless Brushless Drill Driver with its lightweight compact design allowing it to ft into tight areas the Dewalt DCF787 18v Li-ion Cordless Brushless Impact Driver with an ergonomic comfort grip handle providing the ideal balance between being compact but powerful. DCH333 OVERVIEW. DCG414 GRINDER. DCG414 Power 54 V Speed 9000 rpm Spindle Thread M14 Weight 2.2 kg Length 400 mm Height 125 mm. 1 Motor: 54V Brushless. The angle grinder also features a brake on trigger release with a 'constant clutch' to prevent kickback. Brushless DCD795 Combi Drill & DCF887 G2 3 Speed Impact Driver. DeWALT DCK2510L2T. DCD795 2 Speed Combi Drill. DCF887 G2 3 Speed Impact Driver. 2 x 3Ah Slim Style Batteries in T-Stak Case. 18v XR brushless compact combi drill featuring 3.0Ah XR Li-Ion battery technology. DeWalt DCD796 18V BRUSHLESS Combi Drill Specification. The 18V BRUSHLESS Combi Drill has DeWalt DCF88718V BRUSHLESS Impact Driver Specification. Powerful BRUSHLESS Cordless Motors. Battery chemistry XR Li-Ion. DEWALT DCK299D1T1 FLEXVOLT 60V&20V-MAX Lithium-Ion Cordless Brushless Combo Kit! DEWALT DCK277C2 20V Compact Drill & Impact Driver Brushless Kit-FREE SHIP NISB!